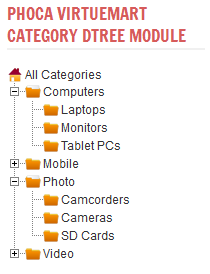 Phoca VirtueMart Category dTree Module is a Joomla! Module which displays unlimited levels of VirtueMart categories in dTree style. VirtueMart 2 (or any later version).